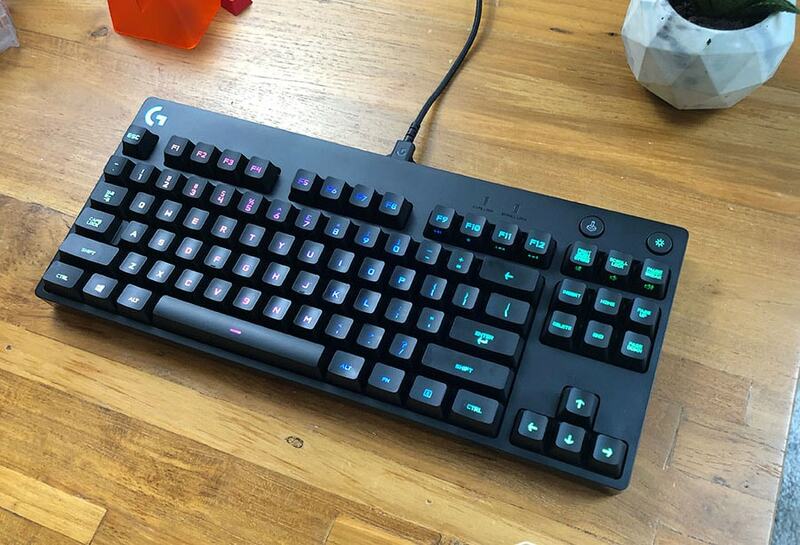 Logitech’s esports focused gaming keyboard is a universal consider for all gamers, TKL size for better ergonomics, really fantastic RGB lighting and short travel Romer-G switches are the factors going for the Logitech G Pro Keyboard. For its premium price it doesn’t come with a lot of extra features, so if you’re looking for wrist rests, media keys, and extra keys, this isn’t it. It’s a completely solid keyboard otherwise, you just sort of have to jive with the minimalist, pure gamer angle. I personally doesn’t like the Romer-G switches for typing, so if you need this keyboard to write papers or you want to customize your keycaps, look at other switch alternatives. It doesn’t quite make our best keyboard list but it is a solid board nonetheless. The G Pro Keyboard is a esports focused TKL board that foregoes any over the top design for sleek minimal design. The board has really clean, smooth RGB but it is let down by mushy Romer-Gs that game fine but don’t feel very good to type on. The Logitech G Pro keyboard is a tenkeyless size keyboard, which means it excludes the numpad. This size means this keyboard is great for ergonomics, keeping your hands close together when gaming or if you have a small desk in general. We’d recommend TKL size as an ideal size for gamers, but stay away from this keyboard if you bind actions to your numpad in games. The Logitech G Pro bucks some trends in “gaming” keyboards, sporting a minimal design, no major flourishes, sharp angular edges or dials, just a black rectangle. The overall foot print of the keyboard is small, with the frame just barely extending past the standard TKL layout, the keyboard measures in at 15.3 cm height, 36 cm width and 3.45 cm depth. There are only two non-standard buttons on the G Pro, a button for turning off and on the back light and a game mode button which allows you to to set specific back light layouts for certain games, we’ll go into more detail about that in our features section. In terms of status lights, you have two standard white LEDs for caps lock and num lock status and a large RGB Logitech G logo occupying the top left of the keyboard. I gotta say the RGB of this keyboard is sublime, each individual key is perfectly lit with no bleed or glow. Even the side legends light up fully, the Romer-G switch advantage for RGB is hard to match for any typical cherry mx keyboard. 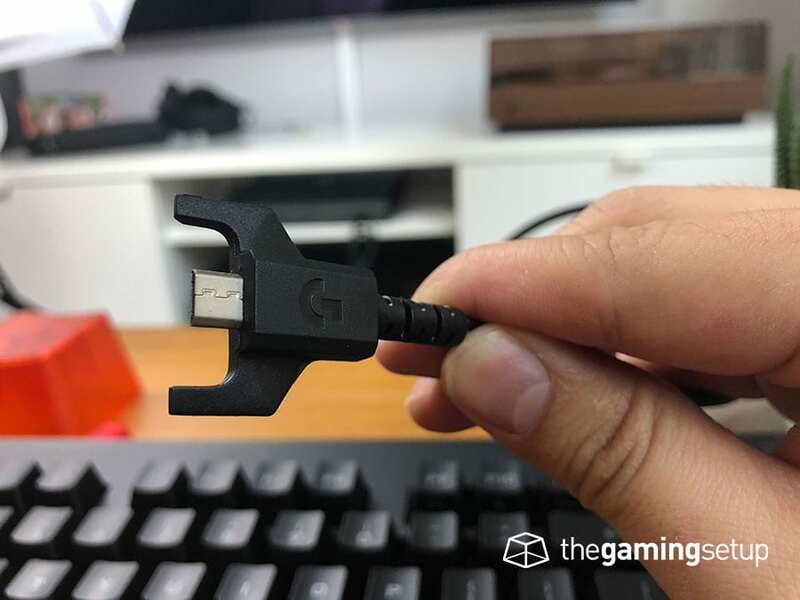 This keyboard is meant to be portable, the G Pro has a detachable micro-usb cable for portability, the cable itself is a trademark thick braided Logitech cable. 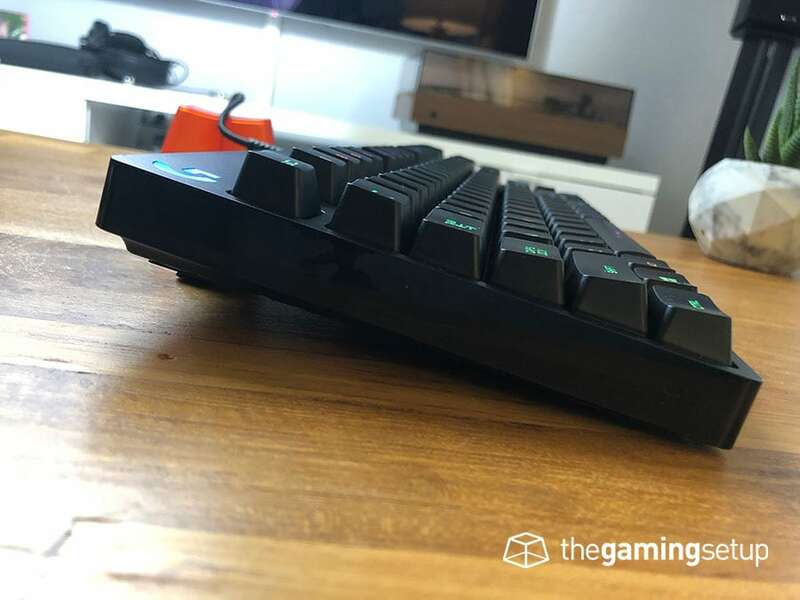 The Logitech G Pro keyboard is well built, while it’s not in the tank category of indestructible, it’s more than reliable for heavy gaming and rage. The G Pro housing is made of a sturdy matte black plastic, I couldn’t flex the keyboard much and the keyboard didn’t creak at all when twisted. Diving inside the G Pro we find a steel back plate backing up the Romer-G switches. Overall, I’m very pleased with the build quality of the Logitech G Pro, you can rely on this keyboard to last. The Logitech G Pro keyboard packs the divisive Romer-G switches, this keyboard comes with the tactile version of the Romer-G. The Romer-G switch is designed purely for gaming, and for that purpose it does its job well, this switch is light and fast with a shorter actuation point at 1.5 mm, bottom out force at 45 grams and total travel distance at 3.2 mm. Tactility is pretty much absent, even comparing to a Cherry MX Brown the Romer-G tactile switches might as well be a linear switch. Bottoming out the switches gives me a mushy feeling that I personally don’t like for typing and didn’t really notice while gaming. Hear how the Romer-G’s sound in the video below. This is a switch you can’t buy blind, if you don’t type much and only use the keyboard for gaming I think it’s good for that, but if you care about your typing experience a lot I’d recommend you test it first before plunking down the asking price for this keyboard. The keycaps are a shine-through type (obviously), made out of the standard ABS plastic. The keycaps are fairly smooth to the the touch and are a standard thickness. These keycaps are made for the Romer-G switch, meaning you won’t be able to get after market key caps for your Logitech board. The font on the keycaps is okay, the keyboard is in all caps with a blocky font. The biggest issue with the keycap font is how horrendous some of the symbols are, the “&” sign being a good example. Since these keycaps are ABS plastic, expect to see and feel some shininess as you use your keyboard more and more, the legends themselves are inset clear plastic so you will not have any issues with legends coming off. I’m a bit disappointed at this price point that Logitech hasn’t included a wrist rest with this keyboard, that’s the only major short coming this keyboard has from a feature stand point. Keystroke signal processing, okay so it’s responsive, most keyboards are. The Logitech G Pro has adjustable feet that give you to set three angles at 0, 4 and 8 degrees. I’d recommend you try using a flat keyboard for maximum ergonomics. 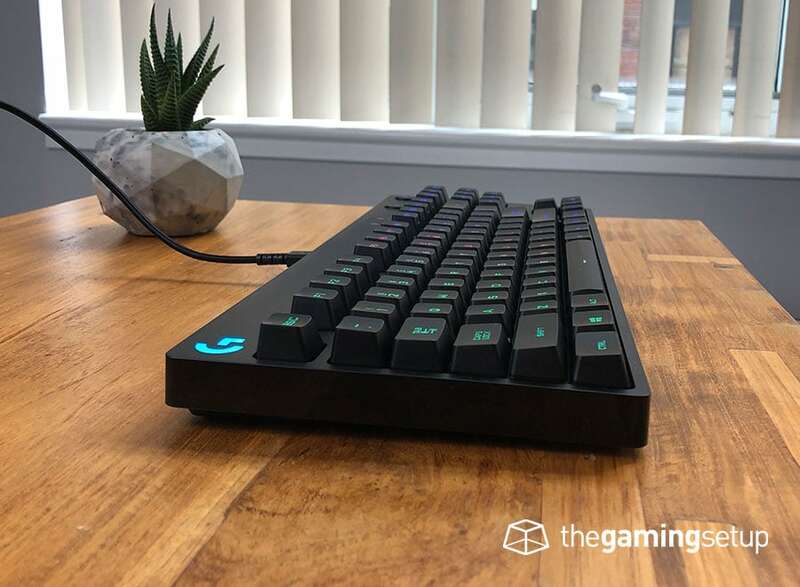 There have been some reports of issues with the backlight on the Logitech G Pro keyboard, but they don’t seem too widespread to be a cause for concern. The Logitech G Pro keyboard is backed by a 2 year warranty. 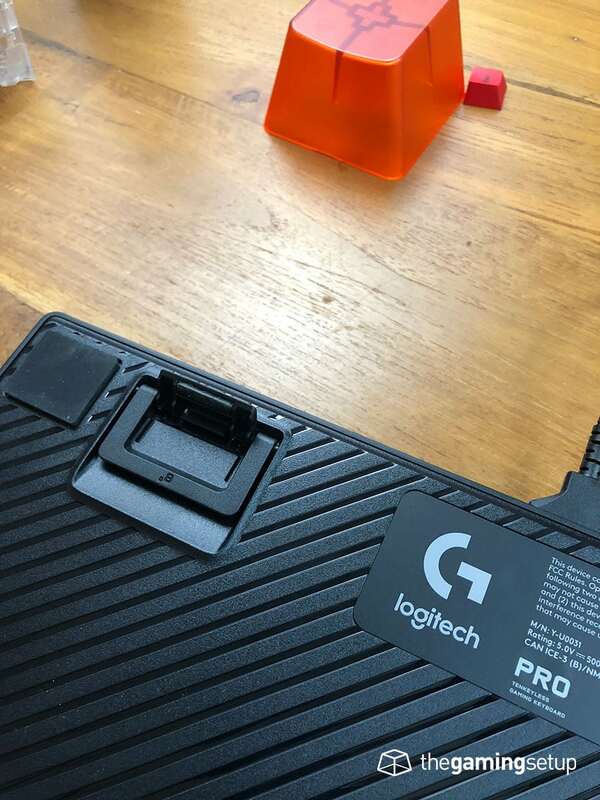 Logitech’s warranty in my experience is one of the best in the industry. 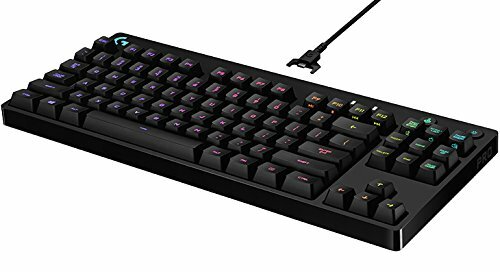 The Logitech G Pro keyboard is an attractive, well-design keyboard that sits on the higher end in terms of price range. The stand out feature on the Logitech G Pro is the fantastic RGB lighting. In general the keyboard is well designed, there aren’t many delights or horrors with it. The Romer-G switch is definitely something you need to try out before buying, I personally think you should go Cherry Browns if you want a tactile gaming switch or a linear Red/Speed switch for gaming without the mushy bottoming out. Buy this if you know you like Romer-G switches and really want the best RGB implementation on the market.